Mushrooms stuffed with cream cheese, cheddar cheese, and spicy Portuguese chorizo. Dice chorizo and cook in a skillet until crisp at the edges (around 5 mins). Drain grease from chorizo and pat with paper towel to remove extra grease. Stir together cream cheese, 4 oz cheddar cheese, and chorizo. Pack cream cheese mixture into mushroom caps. 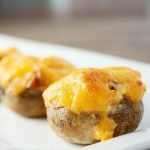 Place mushrooms on a baking sheet and sprinkle remaining cheddar cheese over them. Bake for 7-10 minutes or until cheese is melted and bubbly. Remove mushrooms from the oven and let them cool on a plate with a paper towel on it (to absorb excess moisture).